Women have been the keepers and breeders of seed, with seed being genetically modified and patented, seed has moved from women’s hands to the hands of giant corporations. 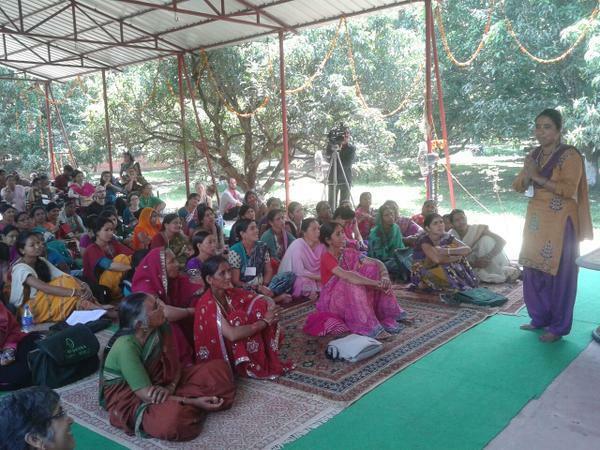 Mahila Anna Swaraj reclaims women’s seed sovereignty and seed knowledge by creating Community Seed Banks. Community Biodiversity Registers help document women’s knowledge of biodiversity. Women have been the food producers and processors. Today food is controlled by the food industry which gives us unhealthy, industrially processed ood. Mahila Anna Swaraj reclaims food sovereignty, and in so doing empowers women economically and gives society healthy, safe, tasty and nutritious food. Once a year, Navdanya organizes a Mahila Anna Swaraj gathering and Grandmother’s University to celebrate women’s traditional knowledge. Navdanya also works with a network of women’s organizations on advocacy on women’s right to food through a National Alliance of Women for Food Rights. At the international level, Mahila Anna Swaraj is organized as Diverse Women for Diversity. No Comments to "Mahila Anna Swaraj – Food Sovereignty in Women’s Hands"